Once again, Indiana opened the game struggling on both ends of the court. The Hoosiers missed their first two shots and added a turnover and Iowa hit three straight to open up a 9-2 lead. Unlike so many other games when the bad start spiraled into the middle of the first half, however, Indiana was able to stop the bleeding and turn the game around. After missing those first two shots, Indiana hit five in a row, nearly all on the fast break off of Hawkeyes misses. Indiana's frantic pace put Iowa on the defensive and helped spark a 13-2 run that included baskets from four of the Hoosiers' five starters. That was the high point for Indiana in the opening half, a 15-11 lead with 14:32 remaining. The breakneck pace didn't slow down the rest of the half, but Indiana wasn't as efficient offensively after that. It was often sloppy with the ball and sometimes fired lazy passes that were easily deflected or intercepted. Indiana turned the ball over eight times in the first half and Iowa took advantage, scoring 16 points off those giveaways for a remarkable two points per post-turnover possession. Several of those possessions ended in 3-pointers, an area where Iowa was hot in the first half. The Hawkeyes hit seven 3s in the opening 20 minutes, including four from guard Joe Wieskamp. The long balls mostly came in transition or off missed rotations by the Indiana defense. Those 3-pointers helped keep Iowa in front and despite 12 points from Aljami Durham in the first half, the Hawkeyes led 46-36 at the break. Tyler Cook was a key for Iowa, scoring 13 points in the half, mostly inside, and dishing off three assists from the post to open shooters. The teams traded baskets early in the second half, though Romeo Langford scored five early points to bring the Hoosiers within 53-47. The biggest development, however, was negative for Indiana. Just three minutes into the half, Juwan Morgan picked up a pair of cheap fouls, giving him four with 16:45 remaining. The Hoosiers' second-leading scorer sat down in favor of De'Ron Davis and did not return until 7:34 remained. 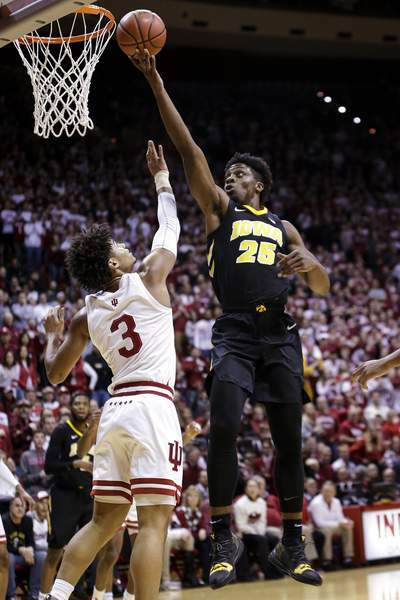 Indiana was able to stay in the game thanks to some inspired play from its guards, especially Langford, who did his best to take over the game. He scored a couple of baskets and went to hard to the rim in a way he didn't in the first half. Every time Indiana made a little run, the Hawkeyes responded, but the Hoosiers were able to remain close. When Langford scored on a tough push-shot from 15 feet away with six minutes left, the deficit had been sliced to four at 63-59. The final minutes were back and forth, with Indiana struggling to get over the hump. Morgan provided a huge highlight with a one-armed put-back dunk that sliced the deficit to 69-65 with 1:13 left, but Jordan Bohannon made two huge 3-pointers in the final 1:30 to keep Iowa in front. Langford made a big 3 to make it 73-70 with 23 seconds left and give Indiana some faint hope, but Iowa hit enough free throws to close the door. Cook was the focal point of everything Iowa tried to do on defense and kept the Hawkeyes in front most of the game. He finished with 21 points on 9 for 17 from the field and added seven rebounds and four assists. Indiana's need to constantly double-team him in the post was directly or indirectly responsible for a number of Iowa's open 3-point attempts. It was Cook's fourth 20-point game of the season. Indiana has lost eight of its last nine games and three straight at home following a 10-0 start. ... Iowa came in No. 1 in the country made free throws and went 13 for 17 from the foul line. ... Langford entered the game sixth in the conference in scoring at 17.4 points per game and scored 22 on 7 of 12 from the field, including 15 points in the second half. It was his second 20-point performance in three games. ... Morgan missed the second half of the Michigan State game with a shoulder injury but started and played 22 minutes against the Hawkeyes. He had 17 points on 7-of-9 shooting. ... Iowa had a 19-9 advantage in points off turnovers. Indiana turned the ball over 12 times. ... Bohannon and Joe Wieskamp combined to go 9 of 14 from deep for Iowa. The rest of the Hawkeyes hit just one 3-pointer combined. The Hoosiers are back in action on Sunday when they take on Ohio State (14-7, 4-6 Big Ten) at Assembly Hall. The game will tip off at 1 p.m. and will be broadcast on CBS. The Buckeyes are coming off a 74-70 win Thursday against last-place Penn State in Columbus. OSU started 12-1, but has struggled since, beating only Rutgers, Nebraska and the Nittany Lions in their last nine games.